You can have as many wool trackers as you wish, provided you have either a unique set of sales / purchase accounts setup or multi-farm enabled. In your main Operations tab, hit Add new tracker and on the following page select Wool from the list provided. 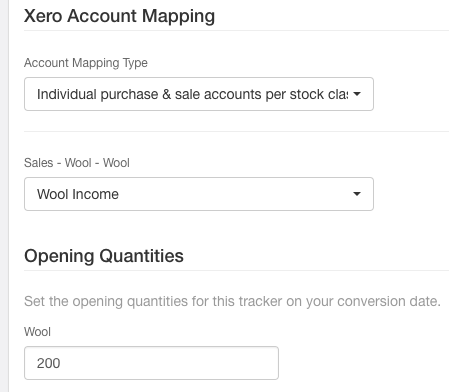 To create a new wool tracker, you'll need to enter a name and the desired account mapping. If you have enabled multi-farm, you'll see an additional option to choose which tracking option the tracker is assigned to. NOTE: Single purchase and sale account mapping means you have one sales and purchase accounts for all of your stock classes i.e. Wool - Sales. Individual purchase and sale account mapping means you have a unique sales and purchase account for each stock class i.e. Ram Wool - Sales, Dags - Sales. On creation you'll be taken to the wool tracker settings page, you can get back to this page at any stage by going to Production > Wool tracker > Tracker settings. Here you can update the standard payment terms (defaulted to 2 weeks), enabled stock classes, Xero account mapping, and opening balances. 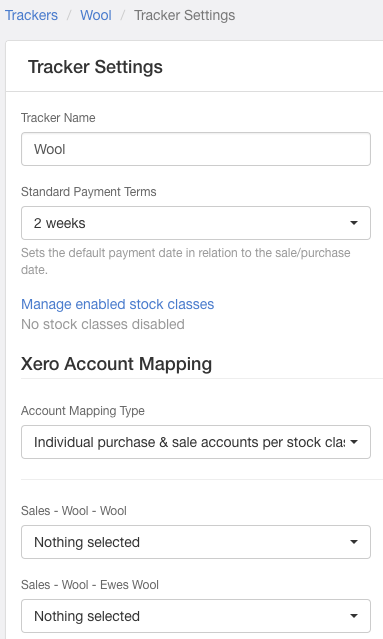 We recommend you managed enabled stock classes first, and then map your sales / purchase accounts second.